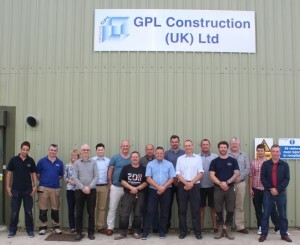 October | 2014 | GPL Construction (UK) Ltd.
GPL held it’s annual Health and Safety Seminar at it’s offices in King’s Lynn on Friday 26th September 2014. Relevant topics for discussion are decided by the GPL team then delivered by Colin Wright, Managing Director of Britannia Safety Training. Attending were GPL’s Managing director Peter Clift, fellow Director Claire Clift, Projects Director Adrian Tomlinson, Office Manager Sarah Thompson, GPL’s Site Engineers and Invited Sub-Contractors. The aim of the seminar is to bring everyone together who has involvement in H&S at work. This year the seminar addressed new H&S legislation, RIDDOR changes and new CDM Regulations. H&S targets for face mask wearing, Managing Asbestos, Working at Height Rescue Plans and New work related technology for mobile devises. Colin discussed changes to the National Accredited Scheme regarding cards and looked at Sub-Contractor Responsibilities. Peter Clift commented on how good it was to see all the delegates interacting, asking questions and so positive about Health and Safety on site. 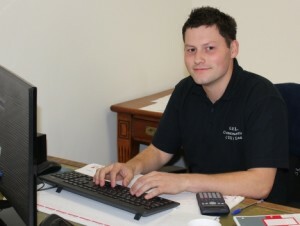 Toby Lloyd has recently joined our team as a Trainee Draughtsman and Projects Coordinator. Toby has had six years’ experience in the industry as a Sub Contractor so has an in depth understanding of the materials we use and the techniques we adopt. His ‘on site’ experience means he will bring his practical knowledge to a project and is fully aware of Health and Safety requirements. He understands what clients are expecting on site and how important it is to work with them and alongside other trades. Toby’s role is to support our Managers with all aspects of their projects. We welcome Toby on board!